Happy Friday! All of us at TE love to see what y'all create with the SASI and Whimsical Wishes stamp sets! It just makes us giddy to see what you can do with rubber and ink! Please be sure to use keyword tayloredexpressions (no space) or SASI anytime you upload your creations to an on-line gallery such as SCS or PCP, so we don't miss a thing! I have been stamping for about 5 years now and I just can't get enough! It all started when a friend and fellow pre-school mom had a little get together in the form of a Stampin' Up! party. I picked up my first rubber stamp that night and I think I've had one in my hand ever since! The best part is since then, I've met so many friends and wonderful women through this craft and I look forward to creating and chatting with them for years to come! Girly. LOL. I'm addicted to "pretty things" like flowers, pearls, rhinestones...the list goes on! I love creating cards, mostly, with lots of embellishments most of the time. Anything pretty that catches my eye usually finds it's way home! That is a tough one, but as a single image, I really love the window from the new Fresh Flowers set. It's so pretty and soft looking and I love seeing what people add to it, whether it be a flower box underneath or in the window itself. As a whole set, I am really loving the new Downtown Diva set. The possibilities of coloring the little storefronts, etc. really excites me and I can't wait to stamp more with it!! I'm a cupcake girl, too, I must admit. Red Velvet with Cream Cheese frosting. My favorite cupcake bakery is simply called, "Cupcake" in Charleston, SC. Dangerous place to walk into LOL!!! For more of Jessica's yummy card creations you'll want to visit her blog The Whimsical Butterfly. Thank you Jessica for being Our Friday Friend! Have a fantastic stamping weekend. In fact, you can hop over to Taylor's blog to play in her weekly sketch the TECC! Oh I am so excited!!! Ijust adore this card! It is incredible! the bling in the backtround the deminsion she created with the windoW! I mean wow! I am just blown away!!! I can definitely see why Jessica was chosen! She is super talented! Wow Wow WOWZA!! What a fantastic looking card! !...the colors, the bling in the corners, the shading on the images....LOVE it all! 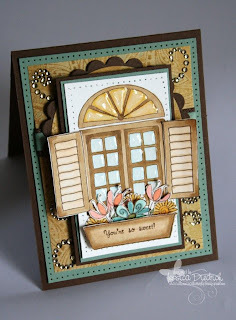 FANTASTIC card....love the shutters she added to the card! Gorgeous flowers too! Congratulations, Jessica! Fabulous card. . .I LOVE it! Woohoo, Jess!! Your card is stunning! !